Can you imagine a Keto Lemon Curd Cheesecake that is zesty, creamy, and so good that no one will believe that’s it’s sugar-free, gluten-free, and keto-friendly? Well, that’s what this lemon curd cheesecake delivers. It will make even your non-keto family and friends into believers. It’s simply that good of a low carb cheesecake. I’m sorry, not sorry for the bragging but I promise you that it’s a keto dessert you’ll be proud to serve. Nothing is more refreshing in my book than a keto lemon dessert. If you share the same love of lemon desserts and are doing a keto diet, you’re in for a major treat. Because this keto cheesecake delivers a lot of flavor with only a few basic ingredients. If you enjoy cream cheese based recipes, then make sure you check out our keto cream cheese recipes for more delicious options. And if you’re a fan of curds then head over to our keto raspberry curd recipe too. I have always been a fan of all types of cheesecakes. 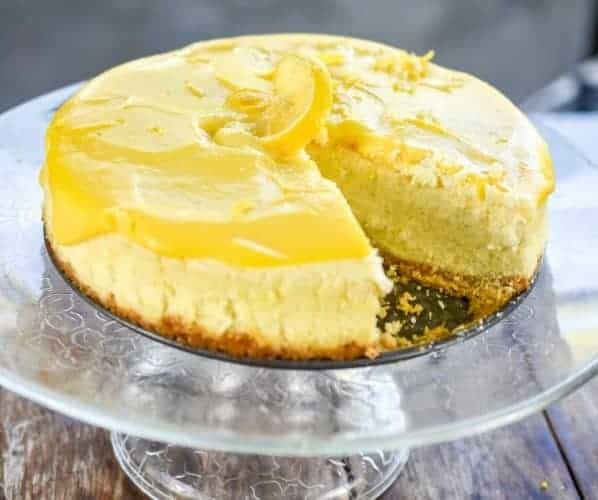 However, what makes this keto cheesecake extra special is that it’s topped with a keto lemon curd. The generous topping of low carb lemon curd is what makes an otherwise delicious keto cheesecake into something really amazing. When I tested this keto lemon cheesecake on my family they went a bit wild over it. They kept going back for more until I had to put my mom hat on and remind them to save some for later. Don’t you just love it when a recipe is that well received? With that being said, I will warn you that this recipe has a few extra steps than my usual offerings. But I will walk you through the recipe as best I can to ensure you get the same results I did. Before you begin to make this recipe, it’s key that you allow your eggs and cream cheese to come to room temperature. By taking this extra step you ensure that the cheesecake batter mixes evenly. So don’t take any shortcuts. What’s also vital is that you use the right type of cream cheese. So make sure you are ONLY using full-fat cream cheese when making a keto cheesecake. And that it’s not a cream cheese that has been whipped for airiness. Although I made my keto cheesecake in a stand-up mixer, you could also opt to make the batter in a high-powered blender. Because I own a kitchen aid mixer it combined my ingredients perfectly, but if you don’t have one, then use the blender. Doing so will make the process easier and save you some time. Remember what you want is for your cheesecake batter to be well incorporated and creamy. Which is why you must blend the batter long enough until you don’t see any lumps. Because what you don’t want is to cut into your cheesecake and find flecks of cream cheese that have not been mixed into the batter. Got it? Since I really wanted to highlight the flavor of lemon in this recipe, I added lemon extract instead of the traditional vanilla that most cheesecakes call for. This little bit of extract allowed the flavor of lemon to brightly come through. You’ll be making a gluten-free crust by using almond flour. It’s important to make the crust for your cheesecake first since it will be baked before you add the cheesecake batter. I make my crust with melted butter, similar to how I used to make my graham cracker crust before I went keto. To make this cheesecake crust you’ll need to add melted butter to a mixture of almond flour, salt, and sugar substitute. Once you quickly combine the mixture, you can press the crust it into a lightly greased 9-inch springform pan. Then simply bake the crust in a pre-heated 350-degree oven for about 15-20 minutes. Or until the crust firms up and it’s lightly browned around the edges. Most cheesecake recipes recommend the use of a bain-marie. Although that’s not always the case with my cheesecake recipes, I am recommending you do so for this one. If you’re wondering what a bain-marie is, it’s a French technical cooking term that refers to the process of using a hot water bath. It allows for an even cooking environment. There is a crucial step you need to do before adding your cheesecake to the bain-marie. It’s that you completely cover the bottom and sides of your springform pan in heavy-duty foil. Otherwise, your cheesecake will end up a soggy mess. Obviously, this is no bueno. To make sure you are doing this correctly, cover the springform pan with foil at least 3/4’s up the sides of the pan. This will ensure that no water seeps into the cheesecake while baking. If you do not have heavy duty foil then use two pieces of regular tin foil stacked together that have been joined by folding all four edges together. Then make a bain-marie by placing a large enough roasting pan in your pre-heated oven, and then adding your prepared 9-inch springform pan into the roasting pan. Lastly, pour enough boiling water into the roasting pan so that it comes up about 1/2 way up the cheesecake. As you can see it’s really important to properly cover your cheesecake bottom and sides. So take your time when adding your foil and make sure it has a tight seal. I find that not enough cheesecake recipes explain the importance of allowing your cheesecake to fully cool before enjoying. But it’s a necessary step that should not be ignored. I feel that the texture and flavor of cheesecake is further enhanced when it’s allowed to chill for a minimum of 12 hours. It was something I always did when I used to make regular cheesecake and it’s still the case when I make a low carb cheesecake. I get that’s a long time, but I promise you it’s worth the wait. Your taste buds will be rewarded for your patience. Once you bake your keto cheesecake, allow it to cool completely on the kitchen counter about an hour. Then wrap it with cling wrap and place it in the refrigerator for 12 hours or overnight. This means you are looking at a minimum of 13 hours of waiting you need to factor in when making this recipe. I assure you that properly chilling your cheesecake makes all the difference in the world. If you want that velvety texture that only good cheesecake has, you’ll need to allow the cheesecake to sit in your fridge and do its magic. This also allows for the flavor to mature and fully develop. You’re going to have to trust me, but it’s what needs to happen to get a perfect keto cheesecake every time. Without a doubt, the highlight of this cheesecake is the keto lemon curd topping. If this is your first time making lemon curd, you’re in for a real treat. Nothing fully compares to homemade lemon curd. 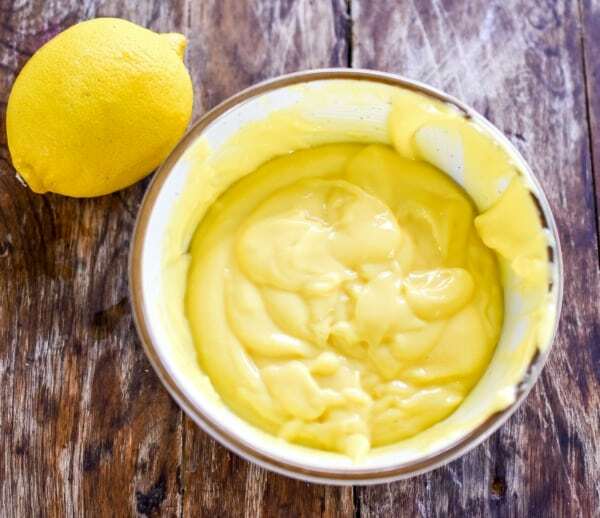 You’ll be thrilled that you took the leap and tried your hand at making keto lemon curd. The bright sunny color of this low carb lemon curd is sure to bring you a smile. It gets its vibrant yellow color thanks to the egg yolks, lemon zest, and freshly squeezed lemon. 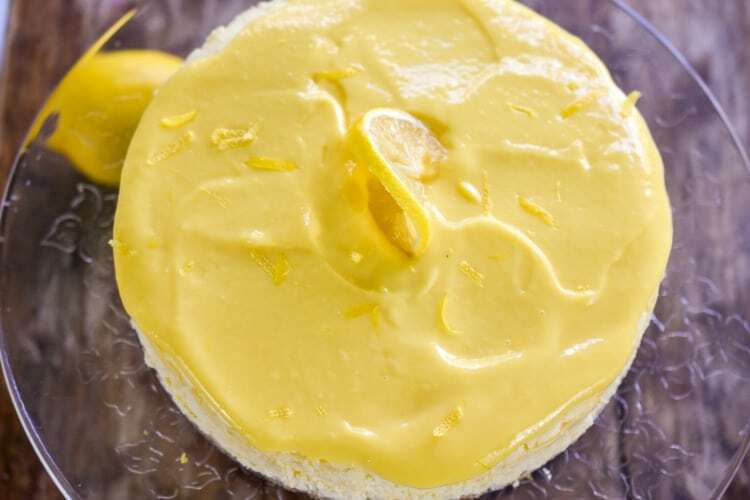 But besides its cheery color, lemon curd has the perfect blend of tangy, sweet, and creaminess. Making it a treat you’ll want to make often. Don’t say I didn’t warn you. To make your keto lemon curd, you’ll need to use a double-boiler. I make my own double boiler by placing a large glass mixing bowl over a pot of simmering water. Just make sure you do not allow the bowl to touch the hot water. What you want is the hot steam to evenly cook your curd. Once you’ve assembled you double boiler you can quickly whisk up your lemon curd. You will start off by adding your butter to the bowl and allowing it to gently melt. Then after the butter is fully melted, you’ll mix in your room temperature egg yolks one at a time. After you’ve whisked all the yolks into the butter then add your sugar-free sweetener of choice, lemon juice, lemon extract, lemon zest, and a little bit of sea salt. Keep your eye on your curd by constantly mixing it. Now’s not the time to step away from your stove. Make sure you continue to whisk your ingredients until the lemon curd fully thickens. This won’t take very long because the egg yolks emulsify rather quickly. After your keto curd has fully thickened, you’ll need to place the curd through a fine-meshed colander. This step is important so that you can easily remove the grated zest and to ensure it has a velvety smooth texture. Then simply place your lemon curd in a bowl and cover with cling wrap. You will need to allow the plastic wrap to touch the surface of the curd so that it prevents a hard film from forming as it chills in the refrigerator. The next day after your cheesecake has fully chilled you can add the lemon curd to your cheesecake. The nutritional facts reflect that I added the full amount of lemon curd to the cheesecake. Because it’s lemon curd people (insert happy dance). However, you may opt to use less and reserve the rest of the curd to enjoy ALL BY ITSELF. But this girl wanted a generous topping and frankly, I am going to bet you will too. Slicing cheesecake can be a little tricky and messy. I avoid this by dipping my sharp knife in hot water and then wiping it clean before each and every cut. You’ll need to keep your cheesecake leftovers refrigerated. In order for the lemon curd not to form a crust on the cheesecake, here again, you will need to allow the cling wrap to touch the lemon curd topping. You can opt to freeze your cheesecake. but I personally recommend that if that’s your plan that you freeze the lemon curd and cheesecake separately. Not because you can’t freeze them together but because it will be easier to assemble your cheesecake once you allow both the curd and cheesecake to defrost. 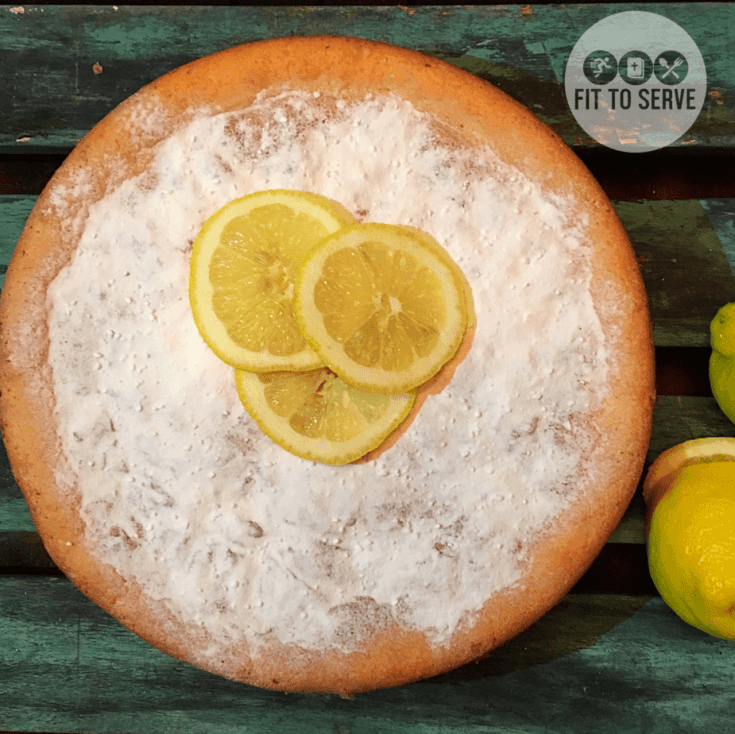 I’m going to assume you’re a fan of lemony desserts so with that in mind, I thought I would share a few other keto lemon treats for you to also try. It's my collection of low carb desserts that feature lemon as the star ingredient. It's a recipe for keto lemon curd cheesecake. It features a low carb lemon curd, cheesecake and a toasted coconut crust for one delicious treat. Keto Lemon Curd Blueberry Cheesecake. 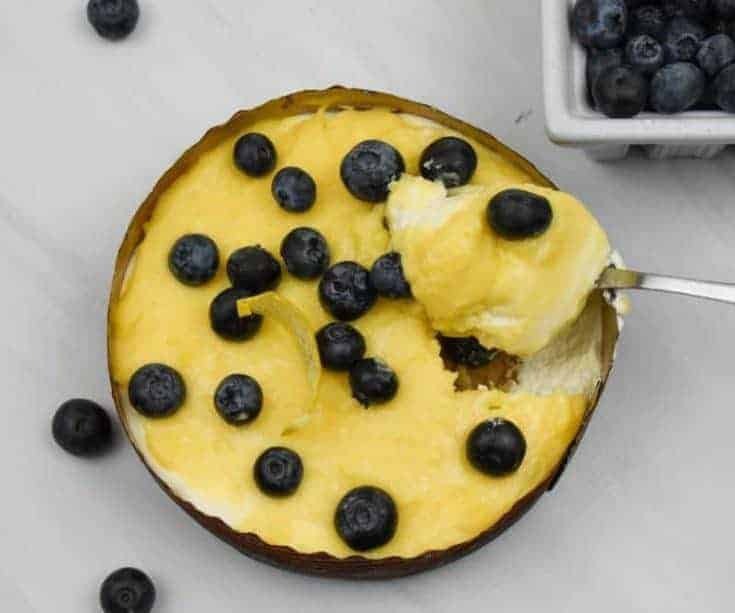 It's a low carb tart that features an almond crust, cheesecake mousse, lemon curd, and fresh blueberries for one delightful keto-friendly treat. 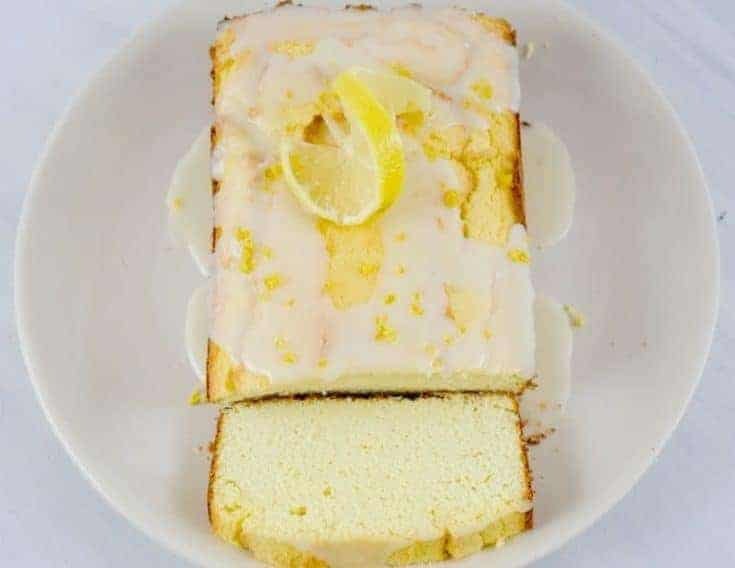 A deliciously rich keto lemon pound cake recipe. It’s a keto pound cake that’s topped with lemon glaze. It’s a recipe for Keto Lemon Pound Cake. It features a vanilla cream cheesecake base that is then topped with a tangy lemon glaze. 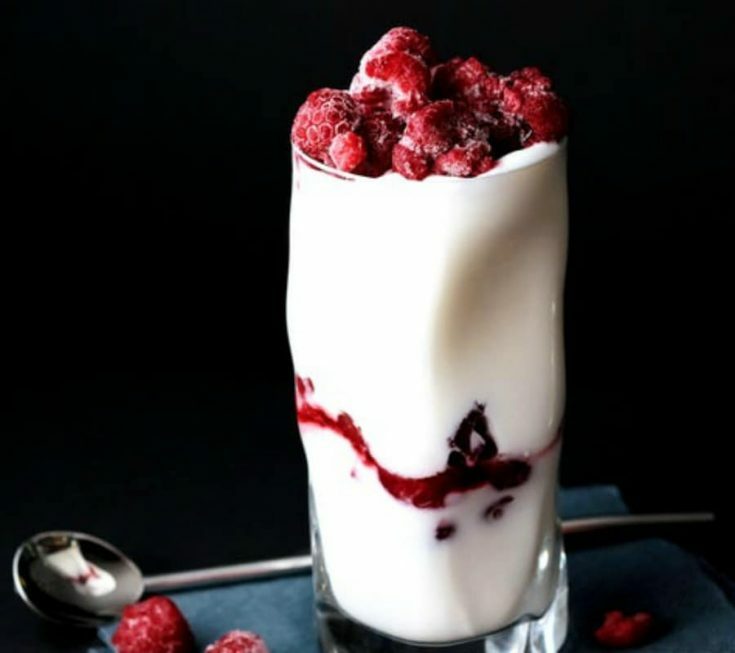 It's a keto raspberry lemonade mousse. Keto Cream Cheese Coconut Flour Pound Cake is a cream cheese pound cake recipe that is low in carbs and keto-friendly. This cake uses coconut flour. It's the perfect option for individuals who want a low carb cream cheese pound cake recipe but who are allergic to almond flour. 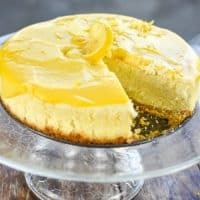 I must say that this keto lemon curd cheesecake is one of my favorite keto desserts. In my opinion, it’s one of those recipes you want to reserve for special occasions since you will need to set aside enough time to make. Although it takes a few more steps, the use of basic ingredients makes for a keto dessert that is worth a little more effort. 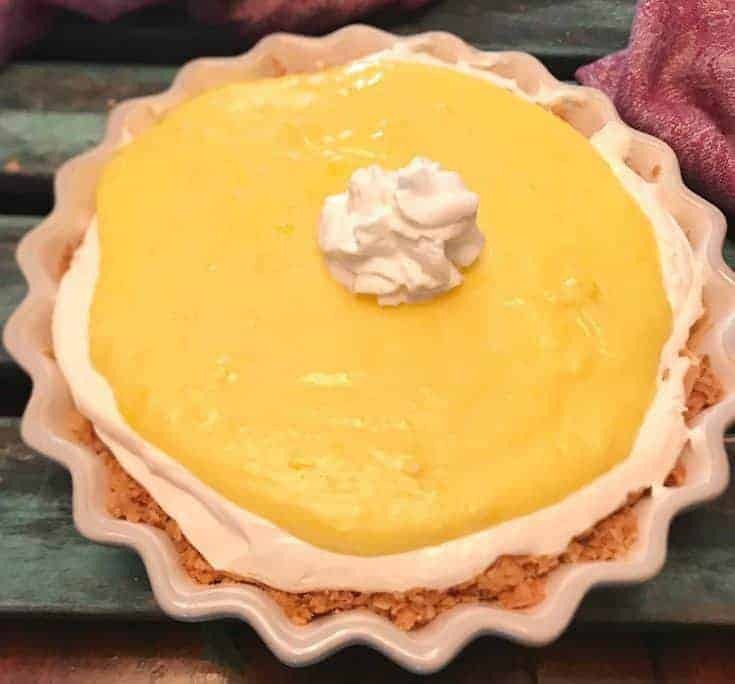 Can you imagine how special it will be to share this keto lemon curd cheesecake with your family and friends for say, Easter? I’ve done my best to try to walk you through this recipe. But as always, feel free to reach out to me with your questions. I am here to serve you and it’s my honor to do so. You might want to also check out my 7 Tips For Perfect Keto Cheesecake If you really want to ensure you get a great cheesecake every time. Lastly, If you’re a Christian looking for support while you do a ketogenic diet, I invite you to join our Private Facebook Group where other believers have linked arms with us. We would love to see you there! Read our post for more information on how we combine our Christian faith with keto for greater transformation. By using exogenous ketones you will naturally elevate your ketones allowing you to enter into ketosis more quickly. Although the use of exogenous ketones is not necessary for achieving ketosis, it is an effective tool for making the process easier. When you experience a deeper level of ketosis, you’ll notice that your appetite is greatly reduced, your carb cravings are more manageable, and you’ll have lasting energy. It’s been our experience that the use of exogenous ketones helps make the low carb lifestyle a viable sustainable option. Which is why we confidently share it. It's a recipe for keto lemon curd cheesecake. 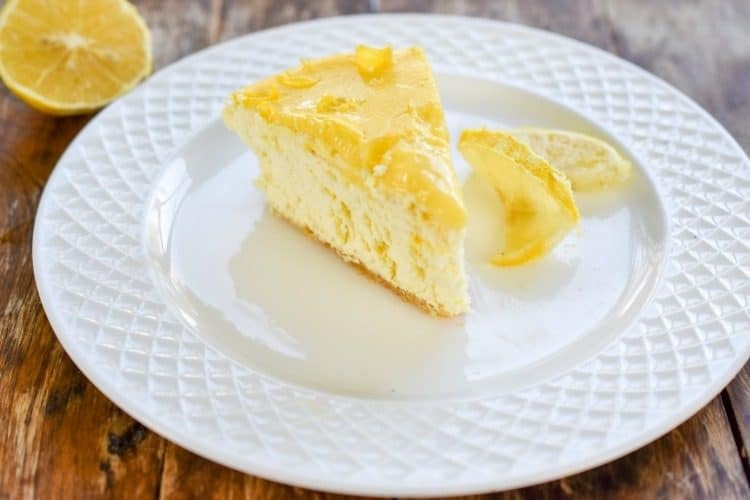 This low carb cheesecake features a rich and tangy lemon curd topping that is low in carbs and keto friendly. In a large mixing bowl using a wooden spoon combine the melted butter, sugar substitute and mix until fully incorporated. Next add the almond flour and sea salt. Press the crust in a lightly greased 9 inch spring-form pan. Bake in a 350 degree oven for 15 to 20 minutes or until the crust is lightly browned. Allow the crust to cool in pan before adding the cheesecake batter. Create a double boiler on the stove top by placing a large glass mixing bowl over simmering water. Do not allow the bowl to touch the water or use a regular double boiler. Once the water begins to lightly simmer add the 1/4 cup of butter to the mixing bowl and allow the butter to melt. To the butter add 8 egg yolks one at a time making sure to whisk quickly. Next add the sugar substitute, lemon juice, lemon extract, lemon zest and sea salt. Combine all the ingredients and whisk until the lemon curd thickens. This will take anywhere from 5-7 minutes. After the curd is ready you'll want to place it through a fine-meshed colander to remove the zest of the lemon and to ensure that it's velvety smooth. Once the lemon curd is made place the bowl in the refrigerator with plastic wrap on the surface of the curd so that a crust does not form on top. You can store your keto lemon curd up to a month in a sealed container in your refrigerator. In a large stand up mixer or a large mixing bowl using an electric hand held mixer beat softened cream cheese, lemon extract, sea salt and sugar substitute until light and fluffy and well incorporated. Next add the 5 eggs one at a time. Alternatively you can use a large capacity blender to mix your cheesecake batter. In which case, you add all the ingredients of your cheesecake into the blender at once. Pour the well combined cheesecake batter into the cooled almond crust. Securely wrap the cheesecake pan with a large sheet of heavy duty aluminum foil or two pieces of regular foil. Make sure to wrap the bottom and most of the sides tightly with the foil. This is in preparation for the bain marie. Place your springform pan that in a large roasting pan that is large enough to accommodate the pan without touching the sides. Next carefully pour boiling water into the roasting pan until the water reaches half-way up the sides of the springform pan. Bake your cheesecake for 70-90 minutes or until the cheesecake is just set and doesn't jiggle when moved. Do not be concerned if your cheesecake has some cracks on the surface after baking. This is perfectly normal. 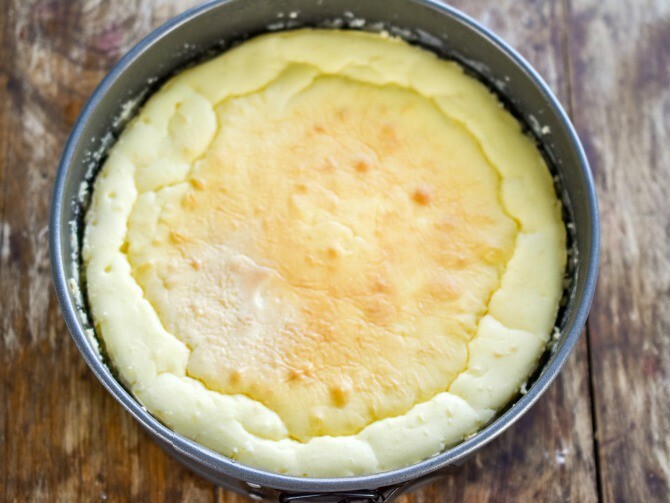 Carefully remove the cheesecake from the roasting pan the (bain-marie) and run a butter knife along the sides of the cheesecake and then release lever of the springform pan. Allow your cheesecake to fully cool on the kitchen counter then wrap with cling wrap and refrigerate for a minimum of 12 hours or overnight. Once the cheesecake has had time to fully chill, add the lemon curd topping to only the top of the cheesecake. Store your cheesecake in the refrigerator or freeze the cheesecake and lemon curd separately.